Predictive, post-operation remote cardiac monitoring. We started the company initially to provide remote monitoring of lonely elderly people with cardiovascular risks. The idea of wearable patch incorporated in a notification ecosystem came from our own experience with the parents. As the global CVD death toll exceeds 17 million people annually and keeps growing, an early detection could save millions of lives. There is a huge problem with CVD detection – 73% of people with cardiovascular diseases fail to notice or neglect symptoms of their disease. Therefore, they turn to doctors too late or not at all. It makes early detection of CVDs and early warning crucial in battling CVDs globally. 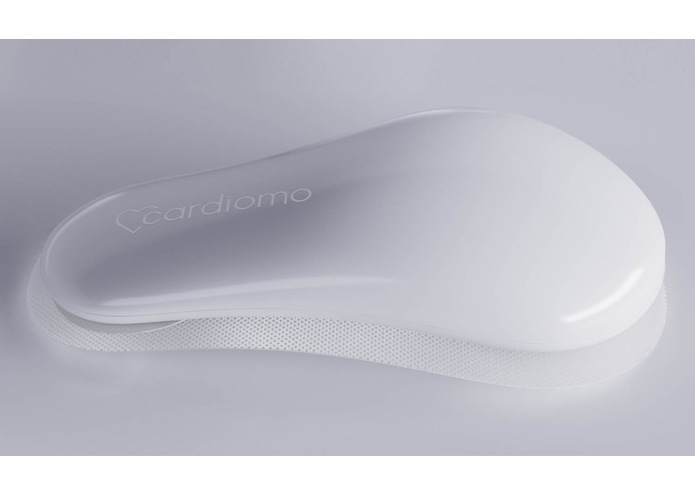 Cardiomo provides a revolutionary 'continuous' cardiac monitoring wearable that tracks vital signs (ECG, heart rate variability, breath rate, skin temperature, activity) using new generation bio sensors and AI Engine to detect Cardio Vascular Diseases with 99.64% accuracy, and predict imminent threats to provide early life-saving alerts. Our own algorithms analyze the data and provide additional metrics: heart rate variability, cardio stress level and blood pressure measurement (provisional patent). Several heart issues can be hard to diagnose unless the data is continuously recorded to capture low-frequency, low-intensity, and even asymptomatic events at the time of occurrence, which helps to characterize the patterns, which is now possible with Cardiomo. The mobile app serves as a display for vitals and metrics, and as a medication schedule reminder. It is also a communication center for user and designated observers — doctors, family, friends. When vitals go beyond normal range or the AI spots abnormalities in the EСG, there is a push notification to the user and/or observers stating the nature of the issue. This remote monitoring feature provides more precious time for rescuers in case of an emergency. Neural networks are analyzing the data for abnormalities both in the app and in the secure cloud service. The AI adjusts itself to each user thus providing more accurate diagnostics. Cardiomo's idea is from late 2015, and since middle of 2015 we co-founders have been working on it full-time. After bootstrapping period of research and development, we founded a company in January 2016. The team was shaped two years ago, but we founders met 16 years ago and have made 3 great projects together. Some of us have sad experience of relatives with CVDs, some are inspired by the challenge to create a life-saving technology. Earlier the company has raised 600K, and has been through accelerator in New York. We are now raising USD 2M; Uses: FDA 501K and CE Mark approval, Serial Manufacturing, Growing the Team, and Market Entry.